People seldom think of Canadian foreign policy when the term “gunboat diplomacy” is used, but they should. It is not just the USA, Great Britain, France or other better-known imperial powers that use military force as a “diplomatic” tool. For example, Postmedia recently revealed that a Canadian naval vessel stopped a boat carrying Jamaica’s former prime minister. Bruce Golding was aboard his fishing trawler last spring when Canadian forces questioned him just outside Jamaican waters. This incident led to the discovery that Canadian ships fired .50-calibre heavy machine guns in Jamaican territorial waters without authorization. Ottawa claimed the Canadian Navy’s actions were the result of outdated maps. In May 1963 two Canadian naval vessels joined U.S., British and French warships that “conducted landing exercises up to the [Haiti’s] territorial limit several times with the express purpose of intimidating the Duvalier government.” The 1963 mission was largely aimed at guaranteeing that Duvalier did not make any moves towards Cuba and that a Cuban-inspired guerilla movement did not seize power. The next year two Canadian gunboats were deployed to Barbados’ independence celebration in a bizarre diplomatic maneuver designed to demonstrate Canada’s military prowess. Maloney notes: “We can only speculate at who the ‘signal’ was directed towards, but given the fact that tensions were running high in the Caribbean over the Dominican Republic Affair [1965 U.S. invasion], it is likely that the targets were any outside force, probably Cuban, which might be tempted to interfere with Barbadian independence.” Of course, Canadian naval vessels (which regularly dock in Barbados on maneuvers) were considered no threat to Barbadian independence. Intervening in another country to defend it from possible outside intervention may be the pinnacle of the imperial mindset. Canada’s military presence reaches beyond the high seas. In 2011 Ottawa signed an agreement to set up a small base to house soldiers and equipment at a base in Kingston and the newly created Canadian Special Operational Regiment has been heavily involved in training Jamaica’s military. Canadian military training in Jamaica has been particularly controversial. When “a battalion of 850 Canadian troops landed in the mountainous Jamaican interior to conduct a tropical training exercise” in the early 70s, Abeng, a leftist Jamaican paper, cried foul. The paper’s editors claimed Ottawa was preparing to intervene to protect Montréal-based Alcan’s bauxite facilities in the event of civil unrest and/or in case a socialist government took office. Some Canadians might explain this away as overzealous military planning, but a historically minded Jamaican nationalist would have every reason to be concerned. Canadian soldiers garrisoned Bermuda from1914-1916 and St. Lucia from 1915-1919. They also replaced British forces in Jamaica from 1940-1946, as well as in Bermuda and the Bahamas during segments of this period. The situation in the Bahamas was even more sensitive. In June 1942 rioting broke out over the low wages received by black labourers. Canadian troops arrived in the Bahamas just after the riots and their main task was to protect a paranoid governor, the Duke of Windsor. 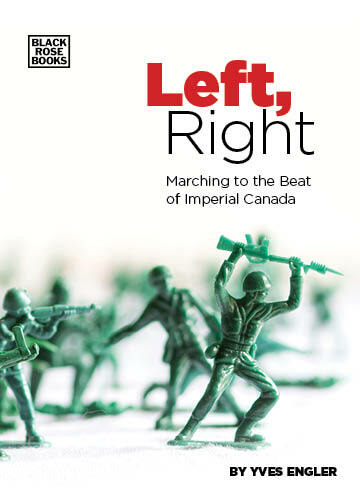 Not only does the current Canadian government engage in gunboat diplomacy, our country has a long, shameful and mostly hidden history of doing so.